Love is in the air at NetBet Casino as you can spin your way to romance with a trip for 2 to a romantic spa hotel in Paris. To enter, you need to opt in (via the ‘Promotions’ section) and deposit a minimum of £50 – then you need to collect Love Draw tickets by wagering £10 on any slot game found at NetBet Casino. You will get double tickets if you wager on the eligible titles from Microgaming – Beautiful Bones, Burning Desire or Secret Romance. Once the promotion is finished, NetBet Casino will randomly select 2 lucky winners. My pick of the 3 double ticket slot games is Beautiful Bones which is a 5 reel, 243 ways to win title which is inspired by the Mexican Day of the Dead festival. Playable on all devices from just 30p per spin, this colourful game benefits from a Wild Spin Again feature where the middle symbol of a win becomes a sticky wild for a free re-spin. 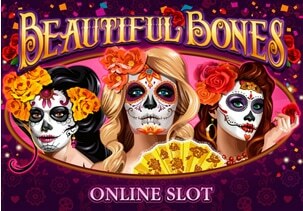 Your main aim is to collect sugar skull scatters as this allows you to enter the Free Spins feature with up to 18 free spins with a 5x multiplier. It can also reward you with payouts of 1,000 times your stake on every single free spin.